Nail Yakupov’s selection by the Edmonton Oilers is a watershed moment in the team’s history. “Oilers” and “Russians” have not exactly been synonymous since 1990. A gifted young man–with a love for the game and a real character–may represent a paradigm shift for an organization that cannot afford to overlook any portion of the planet. This is Jim Harrison of the “Alberta” Oilers. That first team (72-73) boasted players from Bonnyville (Harrison), Flin Flon (Allan Hamilton), Tisdale, Williams Lake, Castor, Wetaskiwin, St. Albert, Regina, Calgary, Red Deer, Stettler, Vegreville, Cranbrook, North Battleford, Delisle, Winnipeg. There were Edmonton kids (Doug Barrie) and a couple from Ontario plus Roger Cote from Quebec. John Fisher–a center–was born in Ayr, Scotland but played his junior hockey in Moose Jaw and St. Catherine’s. The first edition of the Edmonton Oilers was all-Canadian. And that was typical for the time. However, there was a revolution going on in North American hockey, beginning with men like Borje Salming, Inge Hammarstrom and later the Finns and still later Czechs and Russians. The Russian impact on NHL hockey is still recent in historic terms. Alexander Mogliny was the Soviet Union’s first defector to the NHL, and his homeland’s first great star in North America.In 1989, he snuck away from his team after it won the 1989 World Championships, and secretly flew to Buffalo to sign with the Sabres, who drafted him the year before. At that point, Russian government officials were letting veterans like Slava Fetisov, Sergei Makarov and Igor Larionov free from their RSL teams to finish their careers in North America. Anatoli Semenov is one of the few Russians drafted by the Edmonton Oilers who also had an NHL career of note. Of the 226 Russian players who have played in the NHL the most famous who have been Oilers are Nikolai Khabibulin, Boris Mironov, Andrei Kovalenko, Sergei Samsonov and the beloved Igor Ulanov.. The Russian Oilers have done some famous and some infamous things while in the Oilers employ, but I think it is safe to say the young man taken #1 is about to rewrite the script. More than any Oiler prospect in recent history, Nail Yakupov has given people an idea about what a fun-loving young man he is and captured the imagination of the fanbase in a heartbeat. For an organization and city that hasn’t had a lot of Russians players in the heart of the order, Yakupov is about to swing open those doors and knock history on its ear. 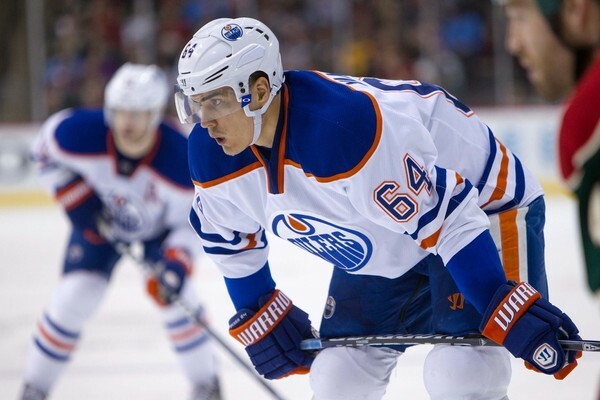 Nail Yakupov signed his NHL entry level contract with the Edmonton Oilers this week. We can (and will) talk about where he’ll slot in the lineup and where his diabolical shot ranks among the young riflemen. The Edmonton Oilers have their first homegrown Russian superstar. Finally, an impact player who’ll embrace the weather. Jonathan Willis, the hardest working man on the internet! Jon took a vacation recently and the internet dropped dead. Seriously. Well he’s back and mystifying, stupifying, enraging, engaging and turning out about one dozen articles an hour. We’ll force him to put down his tablet and spend some quality time with us. Kirk Luedeke from NEHJ and Redline Report. Our man Kirk guided us through the winter and spring with draft tidbits and now we’ll spend a few minutes looking back on winners and losers. I think you’ll be surprised by some of his takes. Cam Davie, Tinfoil Tuque from Canucks Army. We’re going to talk the hell out of hockey, but we’ll also discuss Cam’s involvement inROAD HOCKEY TO CONQUER CANCER and his inspiration for it. If you haven’t read the story, please follow the link and get the back story. You won’t regret it. David Staples from Cult of Hockey. We’ll talk arena, team building, free agency, draft and more with David and maybe look back a little too. Jeff Krushell from Krush Sports Performance. Jeff will guide us through a few health related questions in regard to recovery and we’ll also discuss the possible lockout and how that might impact training, preparation and returning from injury. Looking forward to it, hope you can join Connor Halley and me. Whatever happened to Mironov, and Ulanov? Those two defined stay at home dmen. Im excited for the season to start, just because of the potential line combos in the top 6, and to see how good DD really can be for 50-60 games. Is Jones really on the block? I hope not, other than Smyth I dont see another player that can move up and down the lines when injuries heappen. I really wish the arena would just get built already yes its going to cost a truck load of bling, yes us tax payers are going to have to pitch in, but this is the Capital of Alberta we should start acting like it. The jobs it will give people while its(and surrounding area) getting built is the biggest benifit over anything else the arena will do for this city. I’m guessing the org. thinks one of Harti or MPS can float up and down the lines this year and maybe next (assuming they get a strong cup). growing up in the Russian era (I was 10 in 89) I’ve never quite understood the consistency and depth of the antipathy to Russians and other foreign players. it just seemed natural to watch Mogliny, Fedorov, Bure, etc. what is striking is that some 20 odd years later… ridiculous narratives persist. Hear-hear!! I couldn’t agree more!! I don’t think Edmonton, and Alberta for that matter, have any concern about a lack of jobs. The only average people that will benefit are more temporary foreign workers. Any Albertan with a ticket are already working. The rest that benefit are the ones who are already filthy rich. Rom: I do think there’s a deep rooted bias, Don Cherry being an obvious trumpet. As with most of these things, it’ll probably die with the older generations. If we are going to see more improvement this season Yak has to jump in feet first with the other top 3 . Those 4 need to get at least 100 goals between them upside 110 . If we can get 65 from Hemsky , Gags , Horc Smyth & Jones upside 75 that means the 8 “D” we have need 40, probably 7 or 8 each from Petry , Whit & Schultz and 4 each from the other 5 who will see ice time . Upside of 50 . That leaves Belanger , Magnus , Harts , Eager, Pettrell, Hordichuk and some ice for Lander and that needs to be 30 goals in total upside of 40 . Thats 235 goals with an upside of 275 . If they get what I think thats less than 3 goals a game & no playoffs but if they could hit the upside of 275 we could make the playoffs .Yak gets 25 or 25+ and we may have a shot at it . Obviously barring trades ( Ha Ha , no guts Tambo ). For a long time, all the information I learned about the NHL came from the boxscores in the paper. No sports radio or internet. I’m not sure I could even buy THN anywhere. I certainly didn’t think “Russian” when I read Mogliny or Bure. Ahh, to be in grade 4 and ignorant again…. Russian? Why, whats the hurry? and meeting Tretiak when he came to the Memorial Arena in Victoria in the early 90s. I predict that he will take this city like the Visigoths took Rome! It might take him a bit longer though. Borje Salming–one of my all-time favorite players; the definition of skill, toughness, and character. The man played years and years on crap Leaf teams, but never took a night off. Way under-appreciated IMO. And Ulanov’s quote “…is just pain…” is a classic. Loved that guy. Mironov was always exciting, especially defensively, although not always for the right reasons. Semenov seemed to be a bit of a victim to a combination of the Russian bias and lack of direction from coaching. The guy could cover half the D zone just with his stick reach! Ah, the memories called up during the dog days of summer. Here’s hoping that Yak redefines the Oilers fans’ attitudes towards Russian players! The City initially budgeted 14 million dollars for the Arts gallery and the province kicked in 27 million. Total initial cost in 2007 was 41 million. Whoops. The final cost was 88 million. The city put out another 47 million in expenditures. Someone do the math. It That’s 14 million plus 47 million equals 61 million. Whats that in terms of cost overrun in a percentage? 350%. Three hundred and fifty percent. At the time councilors like Linda Sloan spoke of the need or for good of the City. Mayor Mandel also voted for this white elephant. Also parroting the opinions of the majority that this facility was key to the image of the city as progressive modern city. Flash forward to 2012. The Arena is at 485 million currently. 35 million over budget. You can argue pennies and nickels. But the 8% cost overrun is pittance to what this council has voted for in the past. 485-500 million. When were talking another 35-50 million. Because we were not born yesterday. Costs increase by the day as labour and materials increase. The reality is that the Arena is as essential,if not more to the revitalization of this city’s downtown core as was the Arts Gallery. All those events at the new Arena will bring dollars and people to the downtown core. On event nights the money will flow into an area of the city that badly needs those people spending thier money other than between 9-5. More money spent equals more jobs which equals more investment into the downtown core. The City publishes how much the Arts Gallery makes. Folks in 2011 it was about 160,000 dollars. After expenses. The point is that the economic impact of the Arena district vs the Arts district is like comparing Watermelons and grapes. 35 million? 50 million? Its a pittance in the overall budget for the next 30 years. Its like your wife complaining about the cup of Timmy’s you buy once a month. Its stupid and futile to argue over something that in terms of the City’s operating budget amounts to a cup of coffee once a month at Timmys. Build it and we will come. Young people have to understand the impact 1972 had on our opinion of Russian hockey players. They were cheaters. They flopped to the ice to draw penalties. They KICKED our players, the ultimate act of cowardice. They were the enemy. When I was in elementary school we practiced ‘duck and cover’ in case of Russian nukes comming over the pole. The DEW line was in the news. I am well aware that the Berlin wall came down and Communism has all but disappeared but opinions ingrained from my youth won’t disappear over night. Nobody will cheer more for Yak than me but a small spot, right in the back of my Oiler-centric brain is reserved for ‘I told you so’ if ,God forbid, Yak doesn’t work out. As for Salming, he was an all-time warrior. He faced players like Battleship Kelly and Dave Schultz threatening to break his arm if he touched the puck yet prevailed as one of the only non- north Americans in the game. He 1st appeared in the exhibition games against Canada after the first 4 games of the summit series had been played. He was one of the best players on the ice. Check out the videos of those exhibition games if you can find them. As far as the arena goes, to play Devil’s advocate, why coat the exterior in more expensive zinc which lasts 200 years if the arena will be obsolete in 30 years? I did visit the Arts Gallery last week and there were no more than 20 people in the building, which is spectacular btw. No question a 500 million dollar arena will prove a better investment. Nice article to read….I have always great memories of Ulanov being a very hard hitting player with a booming slap shot. I loved watching those hard playing mean type defencemen who play big and tough like Jackson, Lowe, Fogolin, Manson, Muni, Marchment, etc. Now I am believing Yakupov is not only going to be magic on this team as a rookie like Hall, Ebs, Nuge, but also, he may be ready to take on the role as the first Calder Cup winner this Oiler team has never had prior. Russian or not, this kid has fire, speed, skill and so far….a determination to be the best player on the team and this bodes very well fo the future of this young team. I do already enjoy this kid’s character, confidence and open social type personality with humour. Notice too how very polite he is in interviews and with people around him. Potentially, I can see a sixty point plus season if all goes well with the kids feeding off each other along with Hemsky and Smyth, even Horcoff. If the defence can pass the puck well enough this season then points will come. I say he may be the new first russian player to take the league by storm since Ovechkin, Malkin, and that great Bure took the league by strom in their first seasons. It’s a little early in the day to be drinking Mr. Staples. Waxing poetic for the Oilers blueliners is growing stale. How long are media types going to continue to make excuses for these guys. They did finish 30th,30th and 29th place in the last 3 yrs on record. The trees continue to obstruct our beautiful view of the forest. Am I the only guy that skips down to “What does it all mean?” before reading the post? Harkens me back to the days when Gregor was single. His ice girls weekly was money! My god I’m getting old. When will the Pheonix saga come to a close. Will the NHL start the season once again without an owner. Is that another 25 million plus cheque that the league has to write. New Jersey? another 25 million? I have to appreciate what Bettman was trying to do with these franchises (minus NJ, that surprises me considering all of their success). He put teams in non-traditional hockey markets to try to grow the game. The idea being that if they stayed there long enough, they would become part of the culture of the city. As the kids get older and have kids, they will grow up in a place that has always had hockey and it would be normal to cheer for the Panthers or Coyotes. The problem is nobody gives a squirt about hockey in those places. Like prejudices (Russian, etc…) the indifference to hockey is being passed down like an heirloom. Cut ties. Put teams in places to make money. Manage your business, Bettman. Great article as always Lowetide. Just a quick note, I believe Sergei Pryakhin was the first Russian player to defect and play in the NHL, not Alexander Mogilny. @bazmagoo Pryakhin was the 1st Russian to be allowed to leave, he didn’t have to defect. I dated John Fisher’s daughter! She was a hoooooooot one back in the day; actually she is very nice girl and was an amazing ringette player! I’m going to assume he still lives in Edmonton area. I think the Oilers have been pretty lucky with the full time Russians they have had with maybe the exception of Andrei Kovalenko, but that’s more of personal issue more then anything. Just build the thing whether it’s 35 over or 50 over; there have been many, many projects the city has funded that went over budget with less economic impact then the arena will generate. Im not sure Oilers have enough people within the organization, who can scout, speak the language, and understand what makes European players succeed in the NHL. Yakupov was a nice pick, but I hope Khabibulin takes him under his wing a little. I wish you guys would stop parroting “downtown revitalization” and “economic benefit” as if it has ever worked. Because no arena in the history of ever has revitalized a downtown. Ever. The one shining example of success was Nationwide Arena in Columbus and its Arena District… that is now a giant financial hole. This is the case study the Oilers used while pitching the arena and it’s a failure now. Stop trying to make people who see 6-8% tax increases year over year (on top of property value re-assessments!) for most of the last decade pay for something they don’t need. The city NEEDS road repairs, better policing, improved infrastructure. *Part* of the city WANTS an arena. See Winnepeg. One of the most successful arena’s in North America, and that was without the jets. Completly revitalized downtown Winnepeg, in fact most new arena development are using it as a standered of business operation. I admit I didn’t know about Winnipeg, but one concern I have is that Canada’s property bubble hasn’t burst like America’s has yet – the event that marked the downfall of Columbus’ Arena District. This is 2012,and of course the KHL is a threat,but it is a threat to Hall-Yakupov-Hopkins-Eberle-Hemsky-Smid,ect,seriosly already there is no “russian”issue anymore,its over already,lets move on.Its healthy to have another pro league to push the NHL to evolve itself as an organisation–and the KHL does just that–every NHL team faces this pressure equally,the Birth nationality of their players is really irrellevant today–we could see Crosby in the KHL one day,trust me I watched Gretzky get traded in his prime,anything is possible.I just want to see Yakupov smash some Oiler records to heck,and put his jersey up in the rafters one day. Great article and perspective on a very interesting character. What I like about the fab four is that they all have different hopefully complimentary personalities. The natural leadership abilities that each possess, will be interesting to watch unfold……..with Hall and Yakapov being the Alpha dogs and RNH and Ebs being the thinking mans hockey players. Now all we need is a couple of tough bottom six wingers to protect what is arguably the best crop of youngster we have seen play together………in a very very long time. I just pray there is no lockout this year……….please owners and NHLPA, do not screw with the fans this time around.